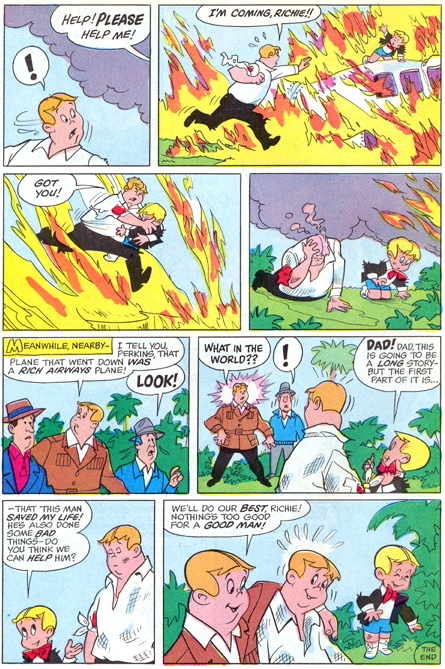 Richie Rich and a Mr. Rich doppelganger nearly go down in flames! Hurrah! We have a guest blogger, the wonderful Jonathan Sternfeld of The Harvey Mercheum! I am so happy when we have guest bloggers because I love hearing other people’s thoughts on Richie. My thoughts are generally, “I love this story!” so any other insights make me giddy! Enjoy! 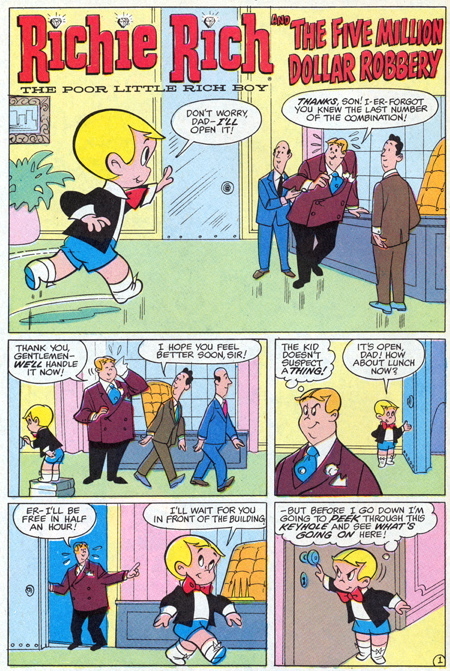 When many people think of Richie Rich stories, they think of several pages of nonsensical action culminating in a panel with everyone who was in the story guffawing over some bad money pun. 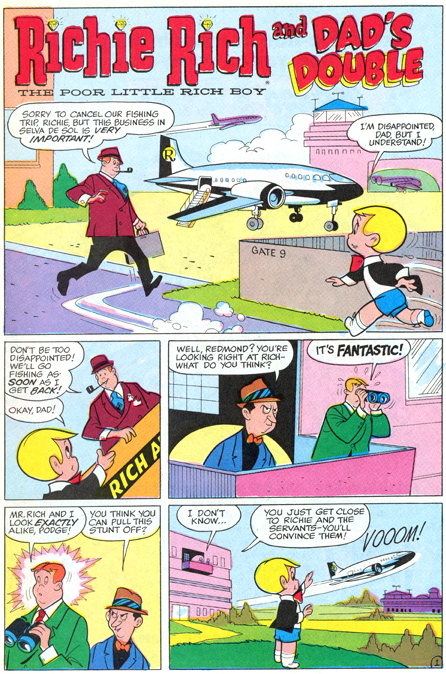 While many such stories appeared around the peak of Richie’s popularity, there is a wealth of stories that do not fit into that mold. Gloria has been doing an excellent job of presenting these better stories, and I thank her for letting me guest post one of my favorites here. 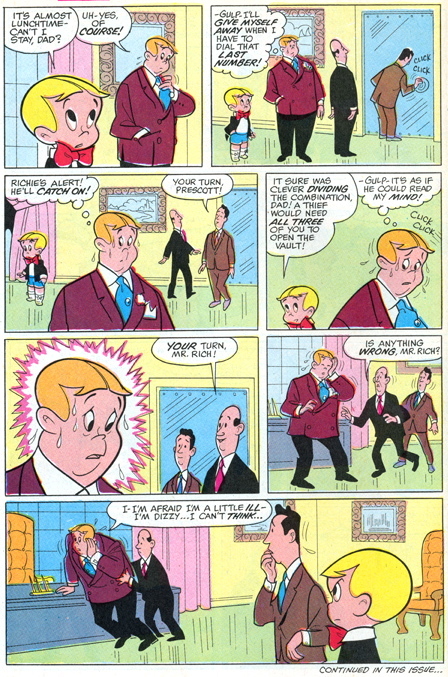 Richie Rich action stories started simple, with themes like Richie fist-fighting the neighborhood bully. This grew into battles against a constant stream of no-name con men, robbers, kidnappers and impersonators. 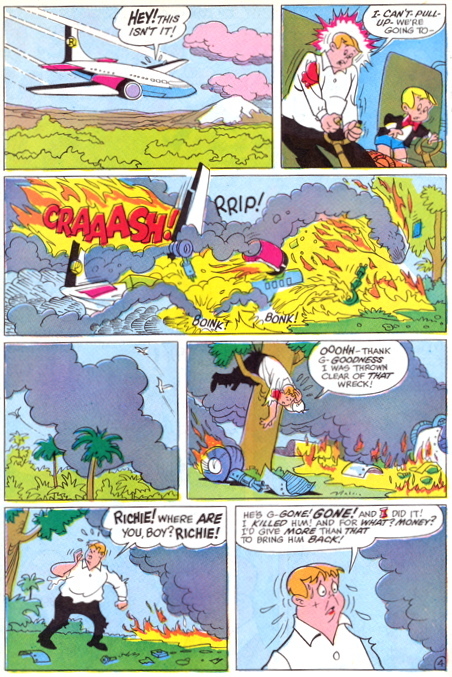 Eventually super-villains emerged, such as the Onion and Dr. N-R-Gee. 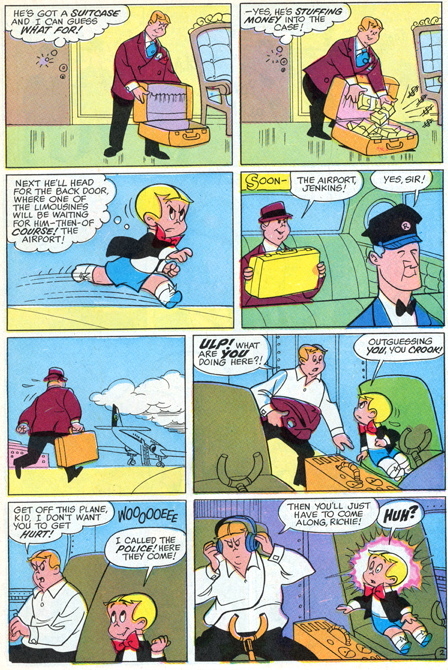 Then, to cash in on the superhero craze, Richie became Super Richie (and then later SupeRichie). I never cared much for SupeRichie with either spelling, but I did enjoy the other types of action stories. I would like to share a ten-page action story, divided into two five-page parts. Interesting note: the two parts actually have different titles, instead of just being “part 1″ and “part 2″ of the same title. Part one is entitled Dad’s Double, and part two is The Five Million Dollar Robbery. 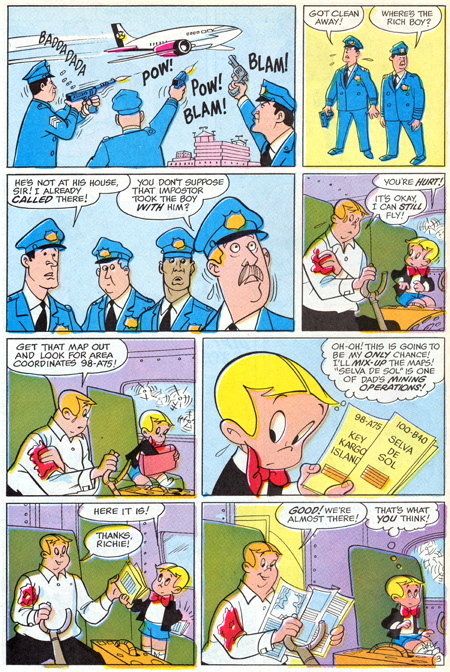 The story appeared in Richie Rich (first series) #48, Bank Book #13 and Millions #34, but it is the cover story for the reprint issue Richie Rich (second series) #17, with new cover art. So here we have a story with Richie at his best. He is brave, resourceful, perceptive and, at the end, kind. He is also at his worst, playing the vigilante instead of getting help. He should have tried to get his mother, Cadbury or someone to back him up, or at least tell someone else about his concerns. This behavior almost gets him killed. This is one of few stories I remember reading the first time. 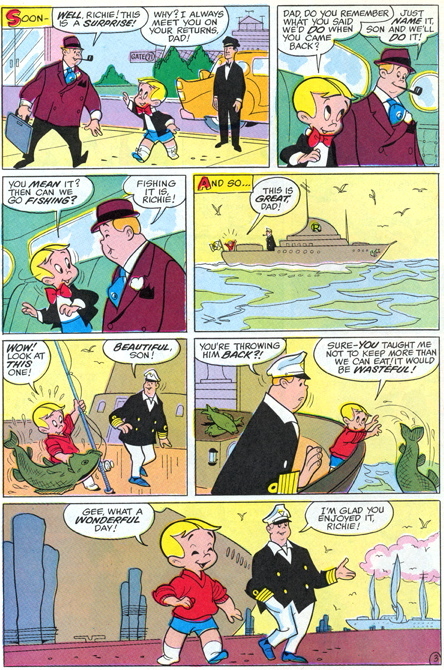 I found it very dramatic and moving, and I cannot think of another Richie Rich story I felt as strongly about. 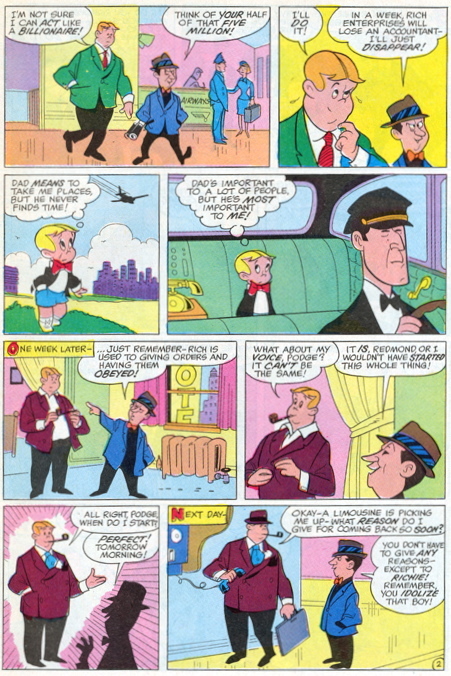 The only suspension of disbelief is right at the beginning, that such an exact duplicate of Mr. Rich could exist. Once you accept that, the rest of the story moves along quite well. I wish the duplicate had become a regular character. 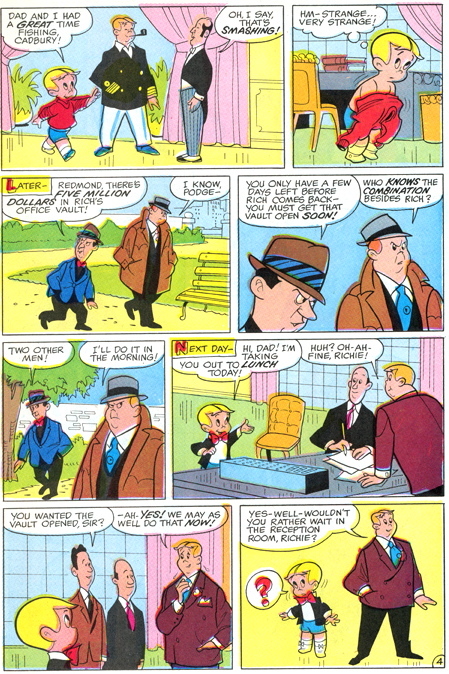 He could have been a body double for Mr. Rich at dangerous events, or they could have done a humorous story with Mr. Rich in two places at once. I hope you all enjoyed this story, and I would like to thank Gloria again for letting me share it with you. Thank you Jonathan for sharing, what a great story! HAPPY NEW YEAR RICHIE FANS! This entry was posted in Uncategorized and tagged Mr. Rich lookalike, plane crash, Richie Rich, Richie Rich in burning fire plane. ← Happy Holidays and Merry Christmas from Richie, Cadbury, and Santa! There seems to be a glitch. The first four pages are fine, but after that the last page is repeated over and over. Wow, I see what you mean, that was all messed up. Okay, should be fixed now, if not, let me know! Thanks! Looks good now! Hope everyone enjoys the story!